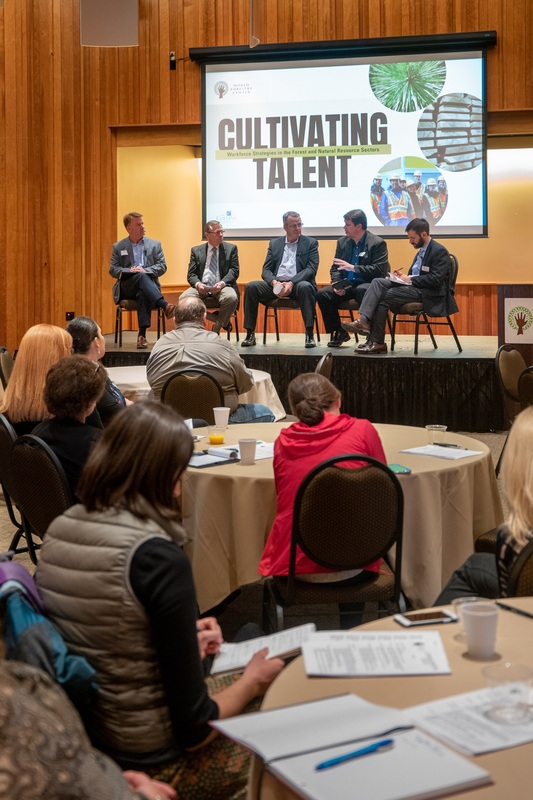 More than 30 organizations participated in World Forestry Center’s recent Cultivating Talent: Workforce Strategies for the Forest and Natural Resources Sectors symposium October 25 in Cheatham Hall. 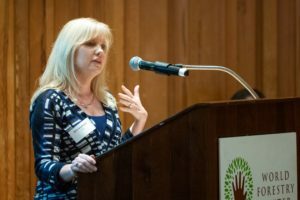 Sponsored by the Collins Foundation and the Oregon Forest Resources Institute, this one-day event focused on workforce solutions and featured four keynotes, five panel discussions, and a networking reception. 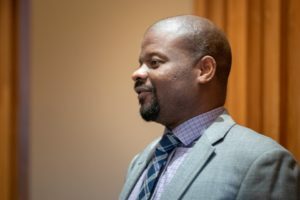 Themes for the day were Employees of the Future and Employers of the Future and featured discussions on communication, training, certification, apprenticeships, recruiting, wages, benefits, retention, inclusion, equity, and diversity. Erin Isselman of the Oregon Forest Resources Institute, and state economist Christian Kaylor kicked off the event with provocative keynote presentations on Oregon workforce challenges and opportunities, and effective communication. Rick Zenn, World Forestry Center senior fellow, was moderator for the Employee Forum. 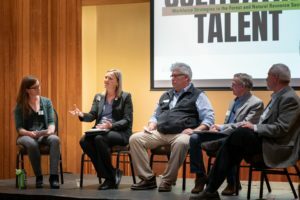 This lively discussion featured young- to mid-career professionals Lisa Ball, Taylor Lucey, Matt Hergerberg, Kaola Swanson, Simon Babcock, and Doug Denning representing a variety of disciplines and organizations, and sharing their ideas and experience about the workplace. Jasmin Brown, a graduate student in forestry at Oregon State University introduced the training and certification panel. World Forestry Center Board of Directors Chair Jennifer Allen welcomed the day’s final keynote speaker Terry Barker, new CEO of Society of American Foresters from Bethesda, Maryland. Jake Gibbs, President and CEO, Starker Forests, Inc.